On April 9th 2012 Facebook announced that it would acquire Instagram for $1bn. An impressive sum for a company less than 2 years old and with fewer than a dozen employees. An even more impressive sum when you realise that Instagram had no clear revenue plan. According to some reports Instagram co founder and CEO Kevin Systrom, who owns 40% of the company, stands to make $400m from the sale before taxes. Instagram is a great app for the iPhone (and now the Android) which allows you to take photos and apply cool filters to them to give them the look of photographs taken on a 1970’s Kodak Instamatic or Polaroid Landcamera. To gauge the popularity of the Instagram app you only need to look at your Facebook newsfeed to see that almost every image is posted via Instagram. In fact I wonder if more photos are taken and shared through Instagram than they are directly from the photo app on the iPhone. According to Forbes.com Facebook paid around $33 per user for the 30 million users as at 9th April, but with the the numbers of users passing 50 million at the end of April, this figure has dropped to $20 per user, which represents a great return on Facebook’s investment. Given Facebook’s users natural affinity with sharing photographs, strategically the investment makes sense, although personally I think I would have been very nervous about paying such a large amount of money for a company which isn’t profitable. Mind you, given that a funding round for Instagram had only closed a few days before, which valued Instagram at $500m, it suggests that Facebook paid the money more for defensive purposes than strategic (ie to stop Google or Microsoft buying it). But this post isn’t about whether Instagram is a good or bad deal for investors or Facebook. 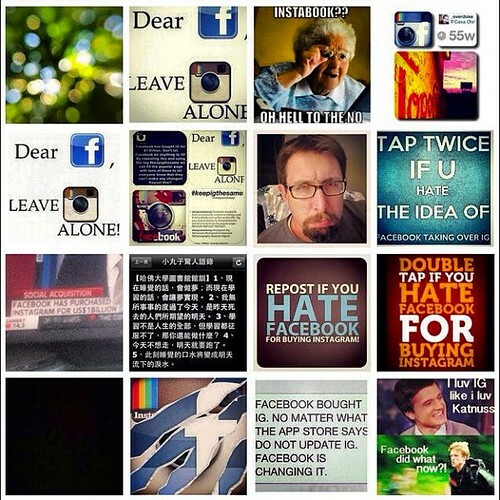 It’s about whether Instagram is a good or bad deal for startups. Because deals like Instagram give the impression that making money is easy and that you can start a business and 2 years later sell for $1bn. According to the Kauffman Foundation around 550,000 new business are created each month in the US alone, meaning 6m new businesses are created annually. So in the time that Instagram has been around, 12,000,000 new businesses will have been created. Or put another way as a business owner you have a 1:12m chance of becoming an Instagram. Which is pretty similar odds to winning the lottery. But also in that two year period around 11m of the startups will have failed as 90% of new businesses fail within the 1st year. So in real terms, even if you survive the first year or two, you have a much greater chance of not being an Instagram than being one. But I’m not trying to discourage you from setting up a business, as its vitally important for the economy that more businesses are created which grow and become successful, so that can start employing people and becoming a social good, paying taxes and reducing unemployment. The truth of the matter is that running a business is hard, you need to have dedication, commitment and passion, but you also need a fair degree of luck. Thinking you’re going to be the next Instagram and going in to business on the basis that you’re going to be the next big thing is a recipe for disaster. You must meet a genuine need which customers are willing to pay money for. If you have a great idea but no customers then you don’t have a business. If you have a lot of potential customers, but no product or service then you don’t have a business either. If you start small, and grow your business at a pace you are comfortable with, then you are more likely to be around for the longer term, because more businesses fail in the growth phase than they do in the decline phase, so plan carefully. The good news is that your chances of becoming an Instagram greatly increase if you survive your first couple of years of trials and tribulations of being a start up. Special Holiday Sale of Chris Guillebeau’s Unconventional Guides + Special BRT Offer!